You've been hearing all about how Joss Whedon's Dollhouse has gone through multiple revamps before hitting the airwaves, but apparently JJ Abrams' Fringe went through a similar (but more secret) series of reconceptions. We've managed to get our hands on early versions of the show's iconic teasers and posters. When you look at them, it's clear that Abrams and fellow creators Alex Kurtzman and Roberto Orci really had to go back to the drawing board on that title and those taglines. What were they thinking? We've got all five leaked posters for you below. 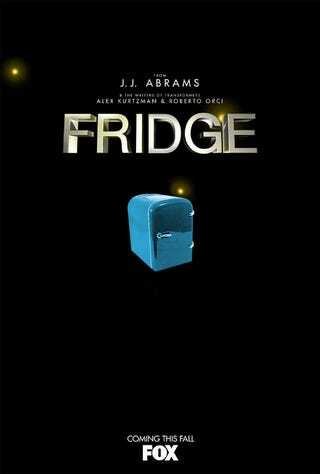 What's so sad about this is that it looks like these guys really had some terrific, original ideas for Fridge that later got shoehorned into this whole "fringe science" box. Imagine the possibilities if they'd just gone with this original concept! Everybody can relate to fridges and how otherworldly their contents can be. Plus, the idea of putting Pacey from Dawson's Creek into cryogenic sleep and then waking him up so he could get busy with an older woman Agent? Brilliant! It's got that pop-reference thing that Juno made so hip, without all the gross pregnancy stuff. Instead of gross pregnancies, we would have had the mystery crisper that churns out freaky fruit leftovers that our investigators Pacey and Agent trace back to its source in the "wormhole backdoors" installed by an Illuminatus-style group within Whirlpool when the refrigerators were being manufactured. Basically these backdoors were going to leave humans open to alien surveillance and impregnation. Can you imagine how cool that would have been? Plus, the mad scientist character was going to have the superpower of scent prescience — he would have been able to smell things 10 hours before they happened. So sometimes he'd smell something, and that would launch a whole investigation. On the show as it aired, his only superpower is peeing in his pants. I'm just disgusted that the entire premise of this early, great show — Fridge — got destroyed by Fox. Now all we've got is Fringe, which is just testimony to the way Hollywood tries to homogenize everything. Image spiffing by Stephanie Fox!